Then stop and restart the service and you’re back in business! I needed a corded telephone with a corded headset for a part time job I was starting to work for. I didn’t want to spend very much money for one, as I wasn’t sure how good a fit the job would be with my schedule and was a little leery about actually getting paid (it is a work at home gig). So I decided to see what I could do on the cheap. We already had a pair of computer headphones with a built in microphone for use with the computers, and I figured I’d make them the center of my home brew setup. I bought a cheap phone for $2 at the second hand store. Amazingly it worked great when I got it home, and I started putting phase two of my plan in place. I bought a pair of headphone jacks for $2.99 at Radio Shack, and found an old computer network cable that I cut up to get some small cables for making the connections. Tracing the cables back from the handset jack on the phone, I could see where the jack connected to the circuit board of the phone. I got lucky that my phone used the colors referenced above – you may have to use the numbered sequence of pins on the jack soldered to the circuit board. I made two small holes in the case of the phone (using a kitchen knife, much to my wife’s chagrin) where there was empty space so I could close it up again with no problems, and screwed the two jacks into them. Then, I soldered the Black and Yellow (#1 and #4) two one of the jacks and labeled it “Mic” and made it pink with a red Sharpie I had to match the color on the plug. Red and Green (#2 and #3) were connected to the other jack with a 470 Ohm resistor in-line. I used a 470 resistor as that’s all Radio Shack had in stock – I figured it was close enough and at $0.09 for five, I could afford to make a mistake. The jack was then labeled “Phones” and colored Green (also with a Sharpie) to match the color on the plug of the headphones. The phone was put back together, and the headphones/mic were plugged onto the jack. I had sound in the headphones, and my test caller said my voice was coming through nice and clear. My total cost: $5.98 – not bad, considering the cheapest phone at Wal Mart was $9.99, and it didn’t even have a handset jack at all being an all-in one phone. If you need a headset for this, WalMart has one for under $5, so your total outlay would be $7.96 if you can find an old/used phone for the same price. You do have to be a comfortable with a soldering iron, but if you’ve got any kind of basic soldering skills, this should be a breeze for you. Scroll down the list under Program Events. Under the Windows Explorer section, highlight Start Navigation. Scroll down the list under Program. Under the Windows Explorer section, highlight Start Navigation. Peace and quite is now restored. I, however think that whoever decided that opening a link, or a folder needed it’s own sound should be beaten with a bag full of “Made for Windows” stickers. I was getting frustrated with my Windows 2008 terminal server, as I though it’s redirection of local printers was broken. I was getting ready to take an axe to it, when a little research revealed that it was doing what it was supposed to… only USB, Parallel and Serial printers will automatically be redirected. Network printers ans many multifunction devices will NOT be. So what’s a guy who wants to use his local network servers in a terminal services session to do? A little registry tweaking will take care of this for you. In regedit, create a DWORD value named FilterQueueType in HKEY_CURRENT_USER\Software\Microsoft\Terminal Server Client\Default\AddIns\RDPDR and set its value to FFFFFFFF. Of you cam download a file to make the change for you here. Unzip it and double click the .reg file to make the needed changes to your registry. On occasion I run across a computer where Windows Update is stuck on “Checking for the latest updates for your computer…”. One of the following suggestions has always fixed the problem for me. Under “Browsing History”, press the “Delete” button. Uncheck “Preserve Favorites website data” if it exists, and check “Temporary Internet Files”. Press the “Delete” button, and once it has deleted all temporary files, reboot and try Windows Update again. 2)Check that the Background Intelligent Transfer Service to is set to Automatic and verify the Status is Started. Locate the Background Intelligent Transfer Service service, and right-click to select it. Status is Started. Click OK.
Click Start, Choose Run, and in the Run box, type services.msc, Click OK. Locate the Event Log service, and right-click to select it. Click Start, Choose Run and in the Run box, type regsvr32 qmgr.dll, Click OK.
Click Start, Choose Run and in the Run box, type regsvr32 qmgrprxy.dll, Click OK. In the Run box, type services.msc. Right-click the Automatic Updates service. Stopping the service will take a moment. b. Right-click the SoftwareDistribution folder, and then click Rename. c. Type SoftwareDistribution.old, and then press ENTER to rename this folder. Starting the service will take a moment. can if need be, copy the contents back from the renamed softwareDistribution.old folder. Losing the history of Windows Updates is not important. I had an application that runs on .Net (ACT! 2010) continually crashing. Tech support promised me that if I uninstalled .Net 2 and re-installed it, everything would be OK. The only problem was, when clicking on the “Remove” button, I get the error message “Microsoft . NET framework 2.0 Service Pack 2 cannot be uninstalled”. After hours of reading through TechNet articles, forum posts and the like, I found the very simple answer: uninstall .Net 3.5 and 3 first. After it’s big brothers were gone, .Net 2 gracefully uninstalled. Now anyone want to make me a bet if ACT! will start running again with a clean install of .Net? I don’t know if this is exactly a “Fun” distraction, but watching the live video feeds from the underwater robots trying to fix the oil leak has been extremely addictive. So fun score = 0, distraction score = 100. Whenever I need to fill out a PDF or make minor edits to one, my tool of choice is PDF Escape, an online PDF editor that’s free. You can perform such edits pretty easily with PDF Escape, an online PDF editor that’s free and also lets you edit password-protected PDF documents in the browser. With PDF Escape, you can hide* parts of a PDF file using the whiteout tool or add annotations with the help of custom shapes, arrows, text boxes and sticky notes. 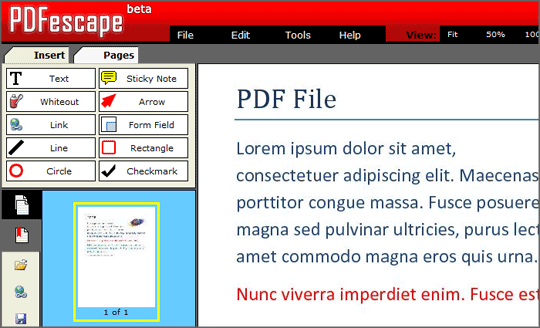 You can add hyperlinks to other PDF pages / web documents. 4. Run the included registry patch “ts_concurrent_session_patch.reg” (by double clicking it), it will update the relevant registry values which are relevant to the concurrent sessions support. I found that in addition, I needed to rename and copy the termserv.dll to %windir%\ServicePackFiles\i386, as well as copying it to dllcache. I also found that if your machine is on a domain, you’ll need to run the registry patch after each logon. Besides that, it’s working like a charm. I’ve had 5 concurrent sessions on my box and haven’t even noticed a slowdown from the console. Users were complaining about getting a Java update pop up window every time they logged into a terminal session. I had pushed out the appropriate registry settings via GP to prevent this on the desktops, but obviously something special needed to be done for the server. Aster doing a little research I found that there is a subkey located at HKLM\Software\Wow6432Node that contains the relevant settings for 32-bit applications. Just to make sure, I also deleted the key HKEY_LOCAL_MACHINE\SOFTWARE\Wow6432Node\Microsoft\Windows\CurrentVersion\Run\SunJavaUpdateSched to prevent the update utility from starting. No more pop up windows = happy users!